An original cartridge is a brand new cartridge manufactured by the same brand that made your printer. 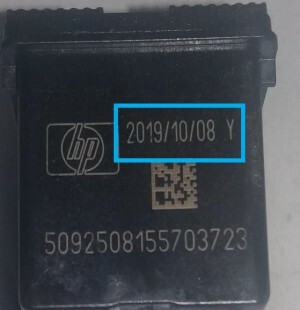 So an original cartridge for a HP printer is manufactured by HP. Another name for an original printer cartridge. This is a brand new cartridge made by a third-party manufacturer. They have no affiliation with the original manufacturers of the printer, any change/alteration to the OEM core body will make this a compatible cartridge rather than remanufactured and the cartridges have not been used before and made from new parts. These compatibles usually infringe the copyright so can cause legal issues. These are original cartridges which have been used once, returned, cleaned and refilled and will work in the same way as originally. Page yields are estimates only from the manufacturers, usually based on a 5% coverage, and will obviously vary according to usage. These are original printer cartridges which have been used once, returned, cleaned, all working parts replaced and then refilled. Page yields are estimates only from the manufacturers, usually based on a 5% coverage, and will obviously vary according to usage. HP 302 and 304 - NEW VERSION (V1) / OLD VERSION. Please ensure you check your cartridges for starter or intro cartridges. On HP cartridges this is usually presented by the word 'Intro' or 'Starter' on the label but on Samsung's it is typically represented by an S after the code. If the cartridge came with your printer then it is most likely a starter or an intro cartridge. These do not always have a value. If you are unsure please contact us before sending your printer cartridges. 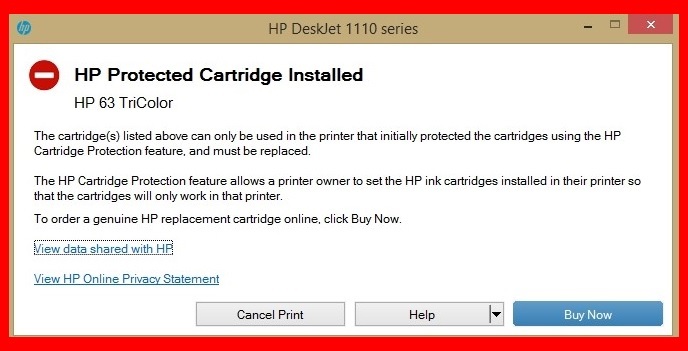 Hewlett-Packard (HP) have introduced this ‘HP cartridge protection’ update on their ink cartridges as part of their latest update to lock the ink cartridges to a specific printer so that you cannot use that ink cartridge again in any other printer(s). 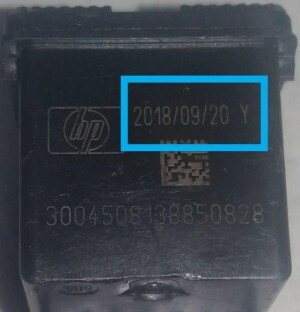 This happens as soon as an ink cartridge is installed into a HP printer and "locks" itself to that specific printer, which means that it can only be used in this particular machine. 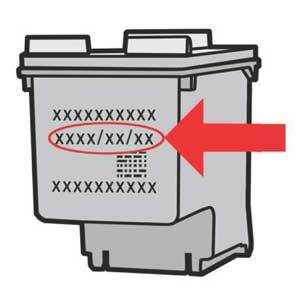 This also means that if you were to get an identical model of your printer you cannot use the same cartridge in the replacement model and also the cartridge becomes non-recyclable as it cannot be refilled, recycled or remanufactured to use in another printer and it will just end up in landfill, in other words an anti-recycling device. Preventing the error message from appearing in the first place can be achieved by disabling the original cartridge protection feature in your printer settings. This will open up the printer’s Embedded Web Server. 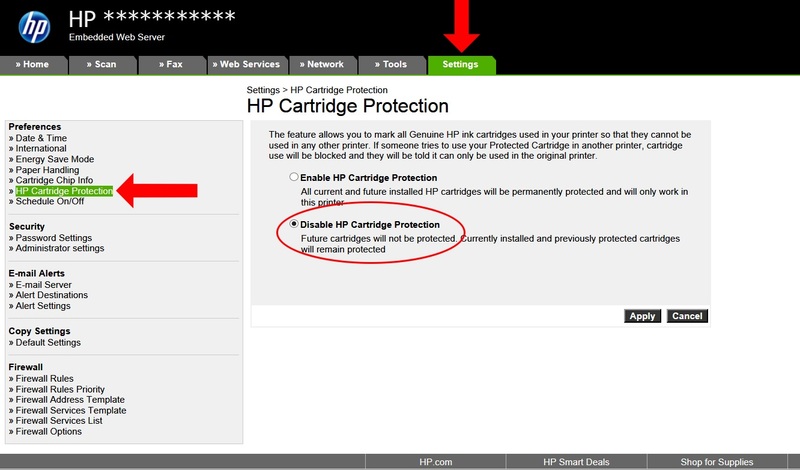 Click on the Settings option and to the left hand side select HP Cartridge Protection. Where do you collect cartridges from? We are a UK-wide collector of inkjet cartridges, so wherever you are based in the UK, we'll buy your printer cartridges from you and then recycle them. We have regular clients from across the nation, including Leeds, Nottingham, London, Birmingham, Leicester, Newcastle, Manchester, Liverpool, Cambridge, Sheffield, Peterborough, Oxford, Milton Keynes and Northern Ireland. Please note: We visually inspect and electronically test inkjet cartridges.We have a ST200 testing machine as well as a variety of printers that check for any failures and electrical faults.